Milan is Rome’s underrated northern sister — and although some say it’s not a beautiful city, we here at TPG think it’s the place to be. Milan is full of fancy fashions, hearty cuisine, a stunning cathedral and chic locals. You could spend your trip simply people-watching — think sophisticated women wearing sky-high heels and men riding bikes in designer suits with tiny dogs in the baskets — but there’s also a whole world of interesting activities to do and sights to see aside from visiting the towering Duomo. Here’s your points and miles guide to one of Italy’s most underestimated cities. Milan’s famous Duomo. Image by Westend61 / Getty. Milan has three airports, Malpensa (MXP), Linate, (LIN) and Bergamo’s Orio al Serio (BGY), but flights originating from the US will most likely get you to Malpensa. If your origin is another spot in Europe, try flying into Linate, as it’s closer to the city center. Orio al Serio is farther away, but it’s a hub for Ryanair, which flies to many other European destinations (cheaply) from there. American Airlines flies nonstop between Milan Malpensa (MXP) and New York (JFK) and Miami (MIA). Economy awards are bookable from 22,500 AAdvantage miles one-way, while business awards start at 57,500 miles one-way at the MileSAAver level. 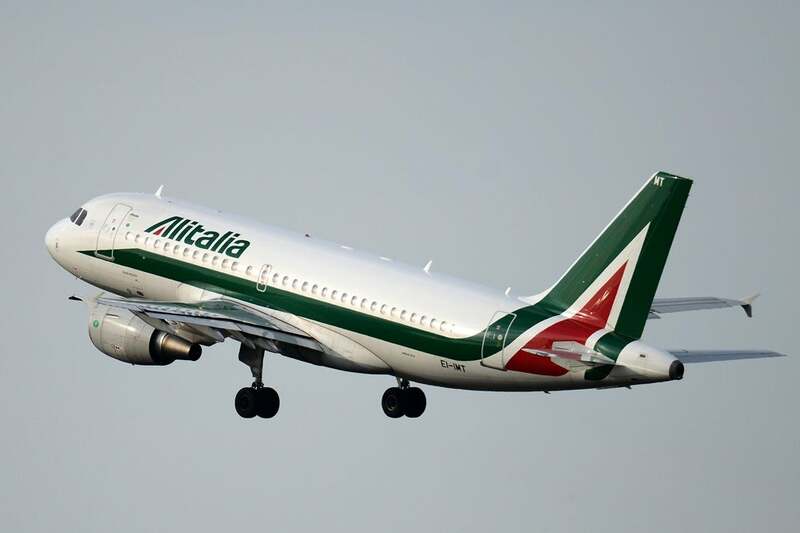 Alitalia has been dealing with bankruptcy, so you may not want to book long term with them. GABRIEL BOUYS / Getty Images. Alitalia flies to Milan from New York (JFK), but note that the airline filed for bankruptcy this year and is currently up for sale, while still operating regularly. TPG Editor-at-Large Zach Honig flew Alitalia in late 2017 without any issues, but it may still be best to consider a Delta flight from JFK instead if you want to fly SkyTeam. Delta doesn’t publish an award chart, but in January you’re looking at rates from 40,000 miles one-way in the main cabin and a whopping 225,000 miles in Delta One. Or, fly from JFK on Emirates’ A380 — and remember, you can transfer Amex Membership Rewards points to Emirates too. You’ll need at least 38,750 Emirates Skywards miles to fly one-way in economy, 62,500 to fly in business and 85,000 to fly in first. United Airlines flies to Malpensa from Newark (EWR); one-way awards at the saver level start at 30,000 miles in economy class and 60,000 in business class. Getting between MXP and Centrale station is simple, as buses run every 20 minutes (8-10 euros/$9-12 each way), and you also have the option to take a train to Centrale and other stations in town and outside. If you don’t want to deal with the masses, you can always or grab a taxi or Uber. Terravision buses (5 euros/$6 per way) run between Centrale and BGY and take about an hour, and Uber or taxi is the easiest way to get to the city center from LIN, which should only take you 20-30 minutes. Once in the city center, you can get around using the metro, bus or tram system. Tickets cost 1.50 euros ($1.8) each way and day/weekend passes are available. There’s also a bike sharing system, BikeMi, which is a great way to get around the city considering Milan is pretty flat. Taxis and Ubers are also available throughout the city. 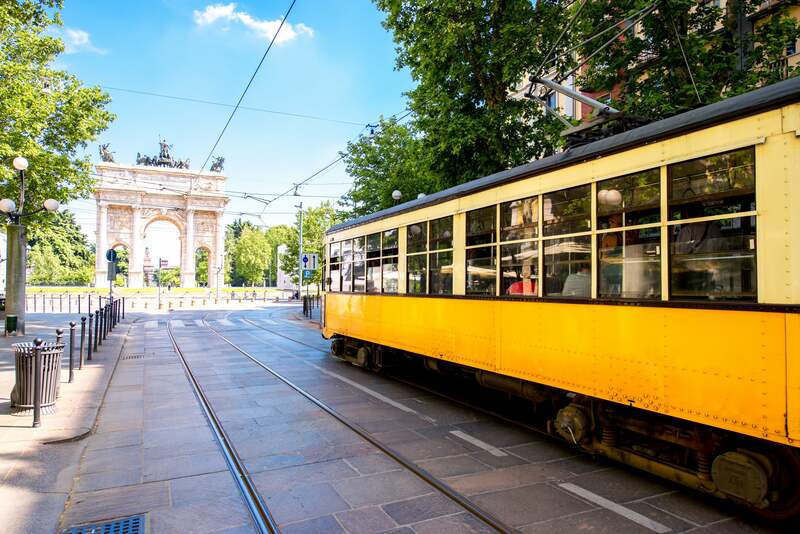 The tram is a fun way to see the city of Milan while getting from A to B. Image by RossHelen / Getty. You can also explore most of the city on foot, which is ideal for sightseeing and checking out new neighborhoods. 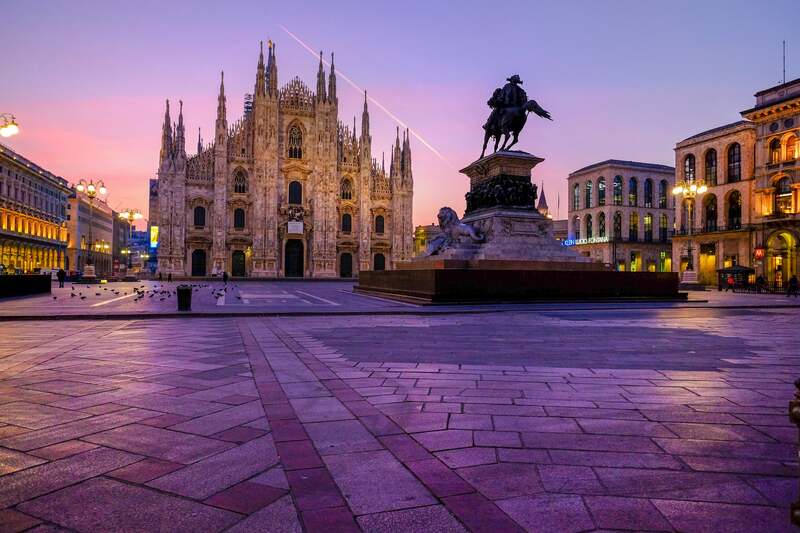 The Park Hyatt Milan is a luxurious option for those wanting to be as close to the Duomo and the Galleria Vittorio Emanuele II (the world’s oldest shopping mall) as possible. Each of the 106 guestrooms comes with amenities like Italian marble bathrooms and Murano glass lamps. TPG enjoyed his stay here back in 2013 and has wanted to return ever since. Room rates start at 490 euros ($575) or 30,000 World of Hyatt points per night. For those in search of a comfortable stay in the vicinity of Centrale, consider the Westin Palace Milan near the Repubblica metro stop. With large and airy rooms outfitted in Renaissance-style decor, this property is said to have an excellent staff that goes above and beyond. Room rates start at 244 euros ($288) per night or 12,000 Starpoints. Usually room rates run quite a bit higher, so 12,000 SPG points per night is an excellent deal. A room at the Westin Palace Milan. Image by hotel. The Hilton Milan is the most reasonably priced property on this list and is located just a block from Centrale station. This hotel is all about convenience, as it offers amenities like a babysitting service and cell phone rental. It’s an excellent stop for business travelers, as the meeting facilities are ample and the Wi-Fi is fast. 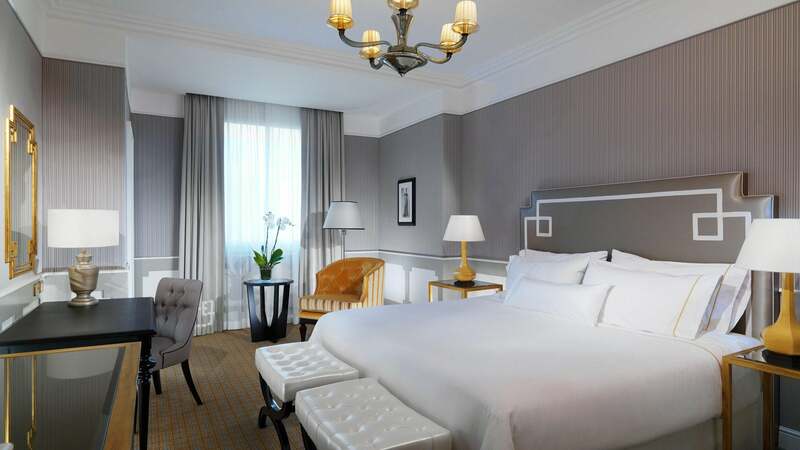 Room rates start at 200 euros ($237) or 80,000 Hilton points per night. Surprise: Venice is not the only Italian city with canals. The glittering Duomo and Leonardo Da Vinci’s The Last Supper will always be Milan staples, but exploring canals is the Milan activity of the moment. The Navigli neighborhood has two large canals lined with boutiques, vintage shops, quaint restaurants and street markets. 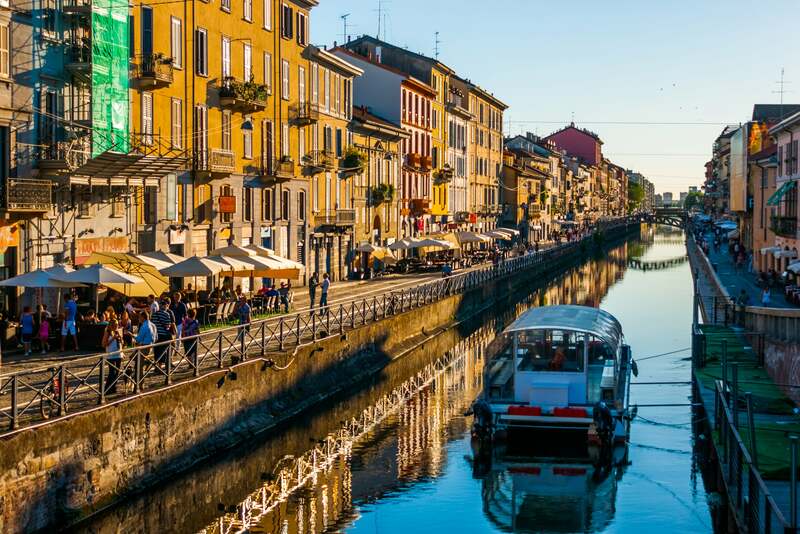 Naviglio Grande is the larger and busier of the two, and Naviglio Pavese is where you’ll find quieter, less touristy restaurants and coffee shops. At night, this street comes alive with bars, some of which are actually located in boat houses in the canal. Join the locals by sitting on the edge of the Darsena, the banks of the canals, to watch the sunset — grab a slice of pizza and beer beforehand, of course. The canal at dusk. Image by artolympic /Getty. 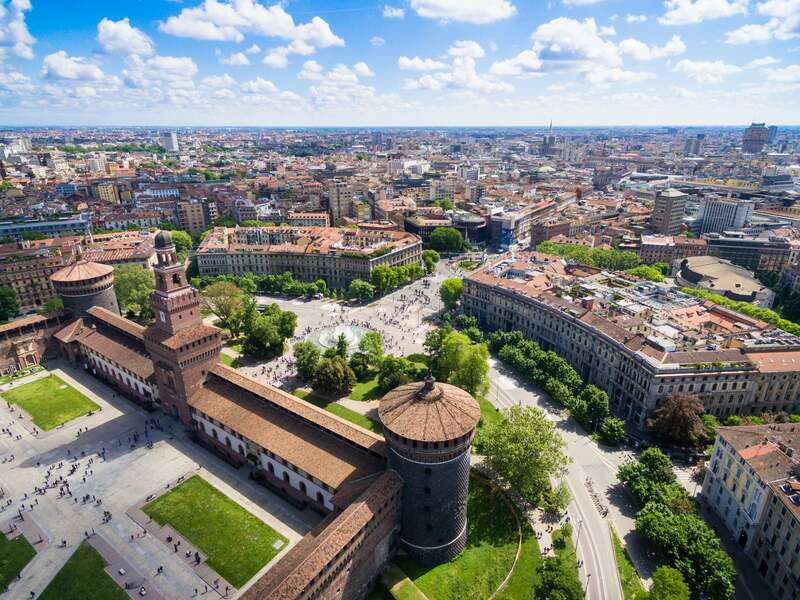 You shouldn’t miss a visit to Milan’s famous Parco Sempione, the city’s green haven, also home to the Sforza castle which dates back to the 1300s. The inside of the castle has art from masters like Michaelangelo, Bramante and Da Vinci, so make sure to explore. The park also has the famous arch, Arco della Pace, covered in horse-drawn chariots and made of marble. An aerial view of the Sforza castle on the edge of the Sempione park. Image by sam74100 / Getty. Of course, you can’t leave Milan without shopping. All of the big designer brands are located on or around Via Monte Napoleone and Via della Spiga, but more local Via Tortona is where you should really head for great bargains on leather bags and wallets and for unique boutique finds. Vintage shopping is best done along the canals and along Porta Ticinese, which also has many-one-of kind shops and outlets to purchase that special piece people will stop to pester you about. “Oh this? I picked it up in Milan,” you can casually drop. The town of Bellagio on Lake Como. Image by kolderal / Getty. 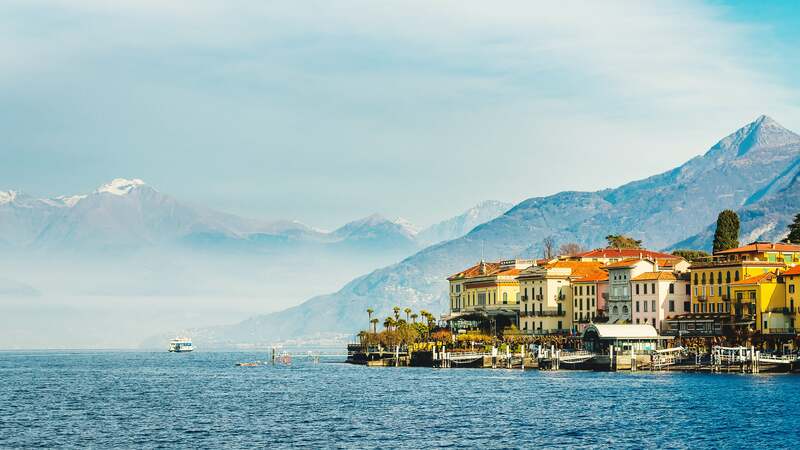 If you’re tired of the fast-paced city, Lake Como and Lake Garda are just a day trip away — so you can rub shoulders with the likes of George Clooney and Madonna while enjoying the mountains and water. Featured image by peeterv / Getty Images.